On a cold February morning in 1993, the final days of the public run rail system were upon us. A new era of a private rail promised commuters a higher quality of travel, more frequent trains and even cheaper tickets. 18 years later and 1000’s of us wake up every day to squeeze into overcrowded trains, with many on prime train lines paying up to £1 a minute for the privilege. But is the alternative of sitting frustrated in traffic any better, let alone cheaper? We decided to find out. We started by comparing the cost of peak return tickets (leaving 8-8:30am & returning 17:00-17:30) and off-peak tickets (traveling after 10:00am & 18:30pm) against the cost of driving over eight different UK routes. On the X axis we have listed each journey whilst on the Y axis we have a measure of cost (the higher up the more expensive) Overlayed on the graph is three lines, blue for the cost of driving (fuel), red for off-peak train tickets and orange for peak hour tickets. It’s pretty clear peak hour trains (in orange) are far higher in cost compared to both off-peak tickets and driving. When comparing fuel alone, driving is cheaper than peak train tickets 100% of the time and against off-peak train travel tickets 87.5% of the time. Much more than expected – an average difference of £71 per journey. Regular car users will be savvy enough to know that driving costs you far more than just fuel. Car depreciation, new tyres, MOT’s and maintenance all cost per mile. But how do we account for this? Since every car has a different level of costs the best we can do is look to HMRC guidelines for allowable expenses for driving per mile. This isn’t 100% since the £0.45p allowance per mile is either incredibly generous or incredibly unfair depending on the value of the car you drive. The new green line represents the cost of driving as per HMRC guidelines. This adds significantly to the cost above fuel, to the point driving is now cheaper than peak train times 50% of the time (rather than 100%) and more expensive compared to off-peak train travel 87.5% of the time (rather than being cheaper). If driving is generally cheaper than taking the train during commuting hours why aren’t train tickets cheaper to encourage less cars on the road, reducing traffic and pollution? In order to compare we took train tickets cost against to salary as a benchmark. “In France, the latest figures released by the Campaign for Better Transport (CBT) show the annual cost of the commute from Ballancourt-sur-Essonne to Paris is just £750. And in Italy, passengers making the journey between Velletri and Rome – which is about the same 23-mile distance – pay £442 for the year. Even more extreme is a Swindon resident buying a season ticket to London, who faces a bill of £8,740.2 Which on a salary of £35,000 would mean working almost half a year just to pay for the train ticket! The hidden cost of your train ticket – privatisation? So why are European trains so much cheaper than the UK? Part of the reason is that they are typically public owned as was the UK in 1947-1993. By being publicly owned the European governments subsidise the train tickets to ensure commuters pay an affordable fare. Hang on! Doesn’t the UK Government also price train tickets? Despite trains being privately owned in the UK, the Government actually still owns all the infrastructure (train stations, tickets, train tracks, signalling etc) who then charge train companies to use them. In fact it is indeed the UK government who also sets price rises on all regulated train tickets. If you’re anything like me you’re wondering why the government still own the infrastructure but charge train companies to use it, yet set regulated ticket prices themselves? Previously the infrastructure was also a private company called Railtrack. However, after a horrific train crash4, the company ended up in a financial mess and with a rail network at standstill. So the government stepped in to provide funding to cover costs. Instead of this all going on repairs/compensation it was used to pay a dividend to shareholders of £137 million (you couldn’t make it up! ), shortly after Railtrack was ‘acquired’ by the publicly owned new Network Rail for £500 million (meaning the UK government took control of the infrastructure again). This is how we ended up with today’s ‘franchise system’ costing the UK government around £4.8 billion a year5 which after inflation is actually £1.2 billion more than the rail network cost when it was still a fully public organisation6.. So if the government set the train tickets prices (like in Europe) why are they so expensive? The main issue with regulated UK train fares being expensive compared to driving is because the price of tickets has nothing to do with the comparable cost of driving – the government simply doesn’t take this into account, instead they price them against inappropriate inflation figures. There are two types of ticket prices in the UK – ‘regulated’ fares which are prices controlled by the government using inflation consisting of Season Tickets & most return tickets.1011 vs 4.1%12). Meaning your train ticket is likely rising faster than your salary. Rail champion Railfuture rightly point out tickets should be based on CPI, not RPI and by not using CPI, rail fares have become 17% higher than they would under the CPI measure.14 Furthermore, during several periods since the railway became private, the government have actually increased rail fares each year by RPI+3% – essentially doubling the cost against inflation. This has created a huge disparity between wages, fuel and train tickets and we’ve all noticed the difference. The cost of driving for most of the population remains cheaper on average than taking the train during peak hours, this is due to the price of train tickets being uncorrelated to the cost of driving which has increased at a much lower rate than the cost of train tickets in the same period. The upside of train travel is that it often allows us to arrive at our destination faster and with less stress (if you’re travelling outside peak hours!). Yet with a rising interest in city traffic levels, pollution and the rush hour crush on many popular train routes, the government should consider stepping away from pricing train tickets against inappropriate levels of inflation and instead base them on the measure the average commuter compares them against – the cost of driving. ‘The train companies, working together in partnership, are constantly carrying out research to develop new products that make travel easier, and better value for money for its customers. Railcards help customers save 1/3 on most rail fares in Britain. We currently have the following Railcards in circulation: 16-25, Family & Friends, Two Together, Senior, Disabled Persons Railcards and Network Railcard. We’re also currently trialling a 26-30 Railcard on Greater Anglia. There are also Regional Railcards. Regional Railcards are generally valid for local travel across a specified area of the network and may be offered by individual train companies or facilitated by local schemes. 1. UK commuters spend up to 6 times as much of their salary on rail fares as other European passengers, TUC. 2. Season Ticket Calculator, National Rail. 3. Centre For London, London's Think Tank. 4. Hatfield Rail Crash, Wikipedia. 5. 2015-16 Annual Statistical Release, Office of Rail & Road. 6. Before privatisation, the annual cost was £2.17 billion in today’s money that’s just under £3.6 billion. 7. Privatising rail worked, we just failed to notice, Financial Times. 8. The Four Big Myths of UK Rail Privatisation, Philip Hadley, Action for Rail. 9. Have train fares gone up or down since British Rail?, Tom de Castella, BBC. 10. 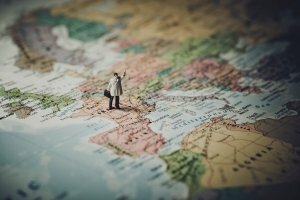 There seems to be an argument about what is or isn't a 'regulated fare' with no concrete answer available, so they may be a slight difference. If you can find one please let me know. 10. United Kingdom Inflation Rate - 1989 - 2018, Trading Economics. 11. U.K. Retail Price Index (RPI) YoY, UK Investing. 12. Merryn Somerset Webb, Money Week. 13. 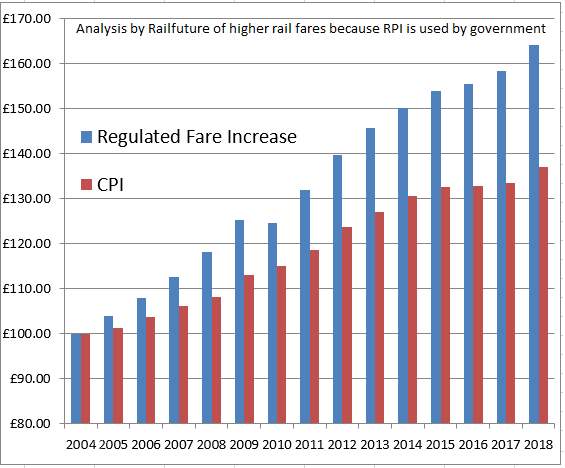 Fare Rises RPI vs CPI, Jerry Alderson, Rail Future. 14. United Kingdom Average Weekly Earnings Growth 2001-2018, Trading Economics. 15. Season ticket sales slide as passengers rebel against cost of rail travel, , Jamie Doward & Toby Helm, The Guardian. 16. Cost of driving based at 45mpg and a fuel cost of 121.7p.